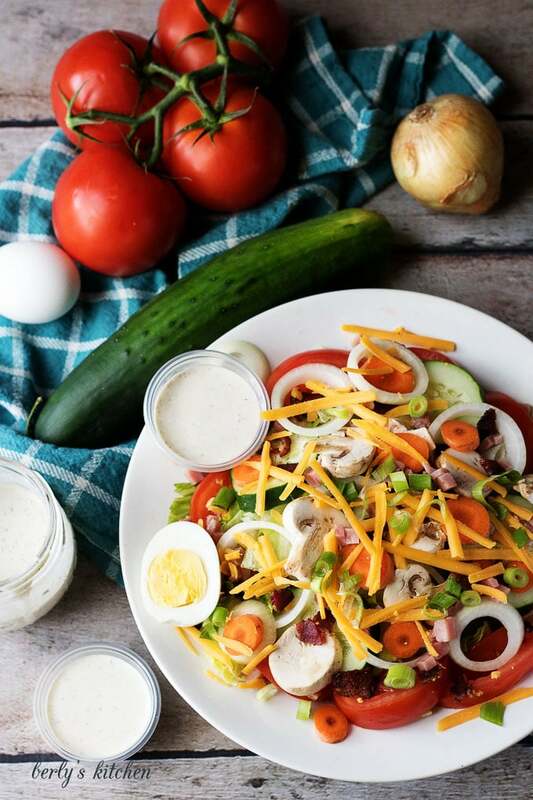 Our copycat classic diner chef salad is a throwback to that perfect entree you just can’t seem to find anymore. It’s loaded with cheese, ham, and bacon! You can get a salad just about anywhere so why put it on a blog? Well, while it’s true that most salads are a “dime a dozen,” but a great salad is hard to find. 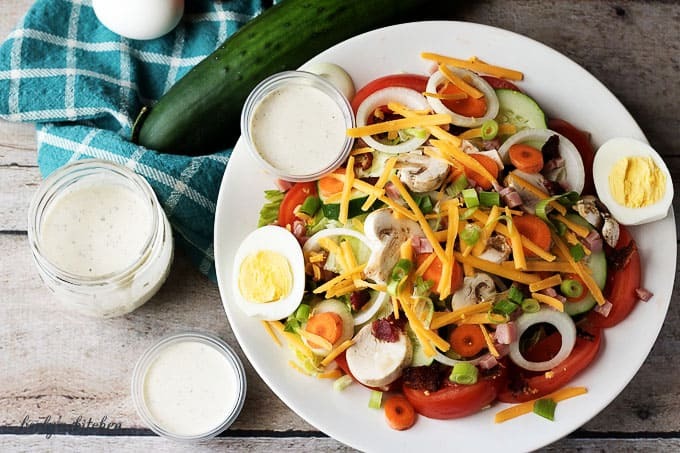 Take the classic diner salad as an example. What was once a mainstay in the American restaurant industry has now faded away. Even with the diner revival of the 2000’s it’s still a challenge to find a chef salad that qualifies as a meal. That’s why we had to share our copycat classic diner chef salad. It’s exactly like the salads I grew up eating at our local diner. We prepared it just like they used with iceberg lettuce, tomatoes, mushrooms, and many other toppings. I know it may seem a little retro compared to modern offerings that feature two or three ingredients and come topped with a vinegarette I can hardly pronounce. Don’t get me wrong; we enjoy fine dining just as much as anyone else. If you don’t believe me, then check out our French-inspired steak dinner for two. It’s a gorgeous meal with multiple courses. But let’s face it, sometimes you want a hearty salad that eats like a meal. 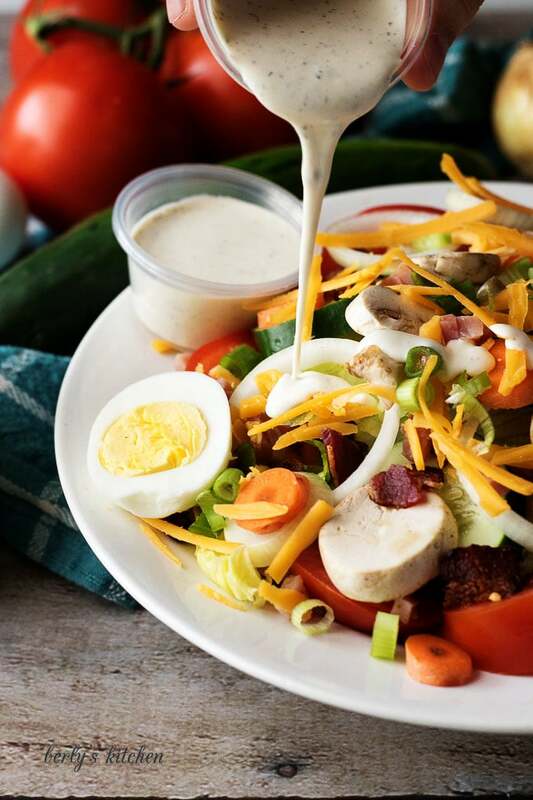 This chef salad is exactly what I am looking for when I want some protein with my greens. Now, at this point, you’re probably wondering what’s on this behemoth of a dish. How about we take it from the top? 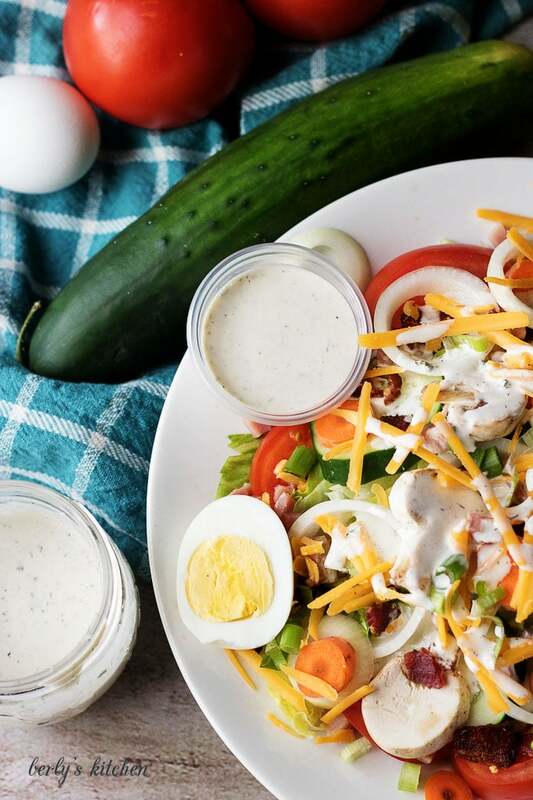 We used a ranch dressing for this chef salad, but it’s not the same one we’ve already shared. This dressing recipe will only be available in our upcoming cook book. I will give you more details on that at a later time. I wish I could tell you everything that was layered into this chef salad, but I would run out of room on the page before I could share vegetable. So, I’ll just stick to what makes this dish so delicious. In addition to a new dressing, we used diced ham and cheese. The cubes of cured pork and shredded cheddar cheese pair perfectly, adding a savory element to every bite. Additionally, the crunchy bacon gives the chef salad a salty flavor that everyone loves. Using two kinds of onion gives the offering a little kick of spice. I could go on and on about every ingredient and how they compliment and contrast each other, but what would be the fun in that? I suggest you give this salad a try and see for yourself. Go ahead and use your favorite dressing or try one of ours. In closing, I wish everyone a long life, everlasting love, and belly full of crunchy salad! 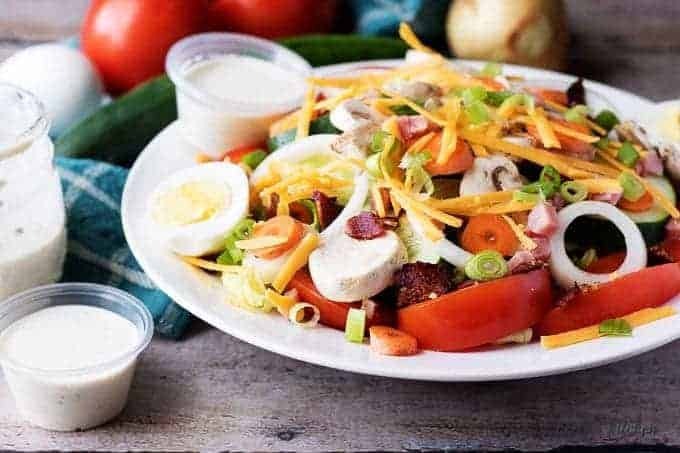 Our copycat classic diner chef salad is a throwback to that perfect entree you just can't seem to find anymore. It's loaded with cheese, ham, and bacon! First, cook the bacon over medium heat in a skillet. Then, dice it into pieces and set it aside. Hard boil an egg, peel it, halve it, and set it aside. Next, wash and prep all of the vegetables including the lettuce, tomato, onions, mushrooms, carrot, and cucumber. Afterward, shred the cheese and dice the ham and set them aside in separate bowls. Last, build your salad starting with lettuce and finishing with the cheese. Toss everything together and then top the dish with your favorite salad dressing. The calorie count listed is only an approximation of the ingredients and DOES NOT include the addition of salad dressing. Actual calories in the dish may vary. The dressing in the photos will be featured in an upcoming cook book. Serve the dish immediately. 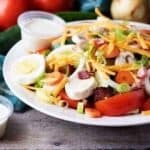 If you are preparing it for later, then wait until you are ready to serve it before topping the chef salad with dressing. I love a diner chef salad. I’ve never tried making one myself, mainly because I can’t remember what to put in it. I’ll be bookmarking this blog post to try the next time I want a good salad. Yum! This is a great recipe and idea for me for my lunches at home. Every time I go to a diner I get a chef salad. I dont know why but they are the best at diners. THis recipe has me wanting to make my own chef salad right now. YUMMY! I LOVE chef salad so much when I am out to dinner but I never think to make it at home. I am going to give this copycat recipe a try. The smoked ham sounds so yummy and the perfect addition. I never remember what is in a good chef salad at home. Thank you, Melissa! I’ve heard people say they can never remember what’s in a chef salad. I can relate, they are loaded with so many ingredients. I am glad you want to give our recipe a try. Have a lovely Sunday! I always enjoy a chef salad, mostly for the egg and ham pieces. I usually don’t get mushrooms or carrots offered to me locally. However, they’d be gladly received. My pizza musto have mushrooms or black olives. Both really make a pizza.